Congratulations on Handbrake 1.0.0 release! The newest version provokes a strong repercussion on account of adding more profiles and VP9 encoder. So quite a number of users wanna download and install Handbrake 1.0.0 or 1.0.7 on Mac/PC to have a try. Yet, fortune is fickle, some users encounter Waterloo when downloading and installing V.1.0.0 or 1.0.7 on their PC, especially on Windows. And nothing has been a silver bullet on Google at this time, since Handbrake is just released on Dec. 24, 2016. Luckily, with the help of software specialist, we have successfully solved this Handbrake 1.0.0 installation problem and wanna share with you guys to help you out of this annoying trouble. 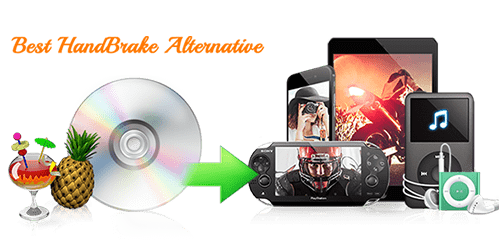 MacX DVD Ripper Pro - unlike Handbrake ripping DVD to MKV VP9 with snail's pace, it will rip DVDs to MKV MP4 MOV MPEG-2 ISO image, iPhone iPad Android with 36X real time speed, without VLC aid to remove DVD encryption tech. * Download and Install Handbrake 1.0.0 on Windows with No Trouble. Handbrake is compatible with Windows Vista to Windows 10. Generally, you can directly go to its official site to free download Handbrake 1.0.0 32 bit or 64 bit on your PC. Afterwards, you double-click the installation package to start to install Handbrake 1.0.0. During the process, it will pop up a window, saying "Handbrake requires that the Microsoft. NET Framework 4.6 Client Profile is installed.". You just click "OK" to continue. When this job is over, you can run your Handbrake 1.0.0 on Windows to try its new features. * Can't Install Handbrake 1.0.0/1.0.7 on Windows? Solution Below. Today is not my day. I download Handbrake 1.0.0 64 bit on my Windows 7 computer with Intel Core i5-3470 CPU processor. After I uninstall Version 0.10.5 from my PC, I install Handbrake 1.0.0 version on my computer. But to my disappointment, the Handbrake installation failed. The pop-up picture is on the right. Another V.1.0.7 user named Nim has the similar experience. He has downloaded handbrake 1.0.7. When he tries to install it windows says: "impossible to execute this app in your PC". He's running on a Windows 10 PRO 64bit, powered by a i7-7700 3.60Ghz and GeForce GTX 1070 armor msi GPU, with RAM of 16GB. Step 1: Free download Windows 7 Service Pack 1 on the Microsoft website. The whole SP 1 file is up to 903 MB, which will cost you a large amount of time and consume lots of traffic. So you're suggested to download and install Windows 7 Service Pack 1 at your spare time. Step 2: Restart your computer to configure Service Pack. This process will repeat twice and cost some time. Be patient, please. 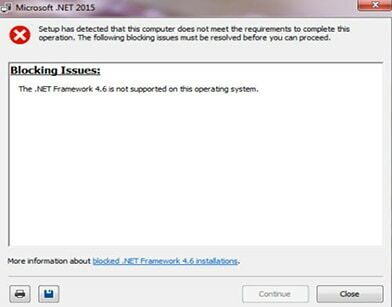 Step 3: Free download and install .NET Framework 4.6.2 after Service Pack 1 installation is finished. Step 4: Launch your Handbrake 1.0.0. on Windows via Run as administrator. Now, it should work on your PC and you can eventually utilize Handbrake 1.0.0 to rip DVD or convert videos with Handbrake 1.0.0 for FREE. Actually, the Handbrake 1.0.0 installation failed solution is not complicated to operate. What really makes it unbearable is that it's really time-consuming. Downloading Service Pack 1 (903MB) needs about 1 hour; installing Service Pack 1 costs almost 25 mins; restart computer to configure Service Pack takes 7 mins; and later 5 mins is used to install .NET Framework 4.6.2. So totally, I spend almost 97 min to get Handbrake 1.0.0 on my computer. A length for a movie, actually. Plus, when I open it, I feel a little bit disappointed, for Handbrake 1.0.0 only gets improved in more profiles (no latest device profiles) and MKV VP9 codec. But it doesn't get a further boost or breakthrough in DVD decryption and video output formats, still MKV and MP4. At least, it doesn't have the point to amaze me. If you have the same feeling and don't have time to install Service Pack or NET Framework 4.6.2, or you're sick of "Handbrake 1.0.7 keeps crashing problem", you can take Handbrake best alternative - MacX DVD Ripper Pro into consideration. No need any help from Microsoft service pack or third party app, this self-contained DVD ripper can rip any DVDs to MP4 MKV MOV AVI FLV VOB MPEG-2, ISO image, etc. numerous video/audio formats and latest mobile devices (iPhone X/8/7/Plus, iPad Pro, etc.). And it can disable any DVD copyright protection tech from DVDs, be it to CSS, Region Code, UOPs, Sony ARccOS Bad Sector, Disney X-project protection, etc. To free download and run Handbrake 1.0.0 on Mac OS X Yosemite, the process is seemingly much easier, so far. I don't meet any trouble, yet. Just go to the official website to download Handbrake 1.0.0 if your computer is running on Mac OS X 10.7 - 10.12 macOS Sierra. Then you can run Handbrake 1.0.0 to convert video or rip DVD free on Mac. As for Mac OS X El Capitan and macOS Sierra users, you might fail to install Handbrake libdvdcss on Mac to rip protected DVDs with VLC player. If so, you can go to the Handbrake libdvdcss download guide to sift throught the effective solutions. Note: Make sure you you have downloaded a safe Handbrake for Mac, instead of a malicious one, such as V1.0.7 (downloaded before 10:30 a.m. EDT on May 2, 2017), with an unknown malicious file including the Trojan replaced the installation package. Though you successfully download and launch Handbrake 1.0.0 on Mac, you might encounter other problems. There are increasing complaints on Handbrake snail's pace in MKV VP9 codec. Another case arising recently is that Handbrake 1.0.0 converts video to MP4 smoothly on Mac but it always removes the video and turns it to audio only. Some users reflect that they select "Very Fast 1080p30" as output profile and the conversion speed is indeed faster than before, but the output video quality is unsatisfactory, blurry image. Nothing is born perfect. See, each iOS operating system has various bugs and errors when it just comes out. The growth is just the process of constantly finding problem and solving problem. So it's quite understandable that Handbrake 1.0.0 has some problems. If currently you can't accomplish your urgent tasks, then you're suggested to resort to its alternative, like MacX Video Converter Pro, whose performance is even more stable than Handbrake 1.0.0 and lets you seamlessly convert any video to MP4, MOV, AVI, MKV, SWF, FLV, MP3, iPhone ringtone, etc. 180+ video and 14+ audio formats. Say goodbye to poor quality, video missing issue and snail pace. Note: After you use Handbrake 1.0.0/1.0.7 or Handbrake alternative to rip DVD or convert videos, you can take advantage of MacX MediaTrans to transfer DVD movies, videos from computer to iPhone X/8/7/Plus (32/128/256GB), iPhone 6s/SE/6/5s, iPad Pro, iPod, etc. for watching anytime anywhere especially when you are in a place with no Wi-Fi. This professional iPhone manager can also sync music, photos, ringtones, eBooks, Podcast, iTunes U, etc. between Mac and iOS devices. Freely move files without any limits. Handbrake 1.0.7 Won't rip DVD to MP4 But M4V Format, Resolved! Struggling with HandBrake 1.0.7 Won't Scan DVD Problems? Fixes Here! Having HandBrake won't scan DVD problem when ripping DVDs? You may have Handbrake stuck scanning, handbrake won't scan all titles, handbrake scanning source DVD takes forever... All of those Handbrake not scanning problems are solved here! As the best alternative to Handbrake 1.0.0, MacX DVD Ripper Pro is able to decrypt and rip copyright protected DVDs on Mac . And it can also make a digital copy of Disney DVD, Sony DVD to MP4, MKV, MOV, AVI, ISO image, MPEG-2 with no quality loss.